Storage clouds are online services for leasing disk storage. Given the multitude of cloud storage providers out there, you must take care in choosing a provider who will offer the maximum amount of low-cost storage and bandwidth, while still keeping your data safe. If you don't yet have a service for storing and syncing your data in the cloud, you need one. One of the best such solution is Privat Cloud. Privat Cloud offers a variety of services. 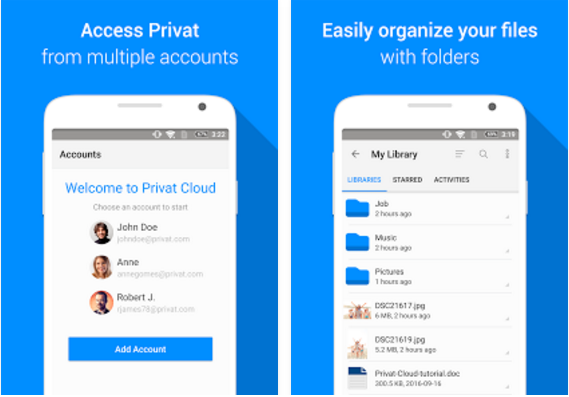 Safely stores your files that you can access from anywhere, shares files and folders with others, you can upload PDFs, Microsoft Office files, photos, videos and other files etc. You will be able to synchronize files from your computer, laptop, and your phone in one place, and enjoy them anywhere in any time. It’s a cloud storage service for secure file management across platforms! Owning a home based business or early start-up probably means you already know the need to have backups of important files, and a way for employees or colleagues to work together–seamlessly. Privat Cloud will provide you all that and will give you access to your files and documents anytime, from anyplace. This neat application will help you be more productive and save on time. Things will be done in a smarter and faster way. The entire folder is continuously backed up in real time providing you access to your folders anytime, anywhere. The bonus is the extent of the storage space. While other storage cloud application offers 2,5,10 GB storage space, with Privat Cloud you will get a massive 25 GB storage space for free. Sit back and relax, let Privat do the work and upload the file you want to the cloud. Do it in a smarter and faster way. Everything is backed up all the time in real time and you can easily access it from any device.